When you’re hopping between infinite planets, travelling slowly towards the center of the galaxy through ever-expanding, procedurally-generated space, you’re going to want something substantial – other than alien whale noises – in your ears. That’s why the whopping ten-track No Man’s Sky OST is releasing just before the game. Listen to it on repeat before jumping in the cockpit, so it’s not so alien. If you love staring at the twinkling blackness, why not check out our list of best space games. No Man’s Sky: Music for an Infinite Universe will be available on double CD, a ten-track double vinyl complete with a download link to a further six ethereal soundscapes, or there’s a deluxe collector’s edition vinyl that comes with all ten tracks and soundscapes. The OST will also be available on streaming services. 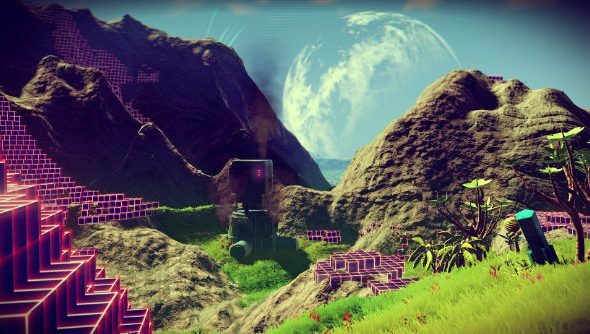 “Being involved with No Man’s Sky is as unlikely as it is exciting, says the band. “Two years of our lives have disappeared into a black hole and we’ve been spat out into another dimension. The OST, by UK instrumental band 65daysofstatic, launches (releases) into orbit (shops) on June 17. If you want a taster, you can listen to one of the tracks, called Supermoon, for free on Soundcloudnow.